Lexus has augmented the NX 300h crossover with a new Sport model. 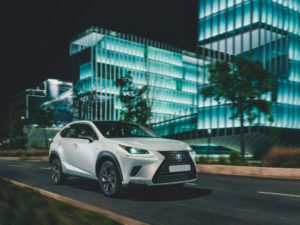 On sale from 1 June and priced at £36,500 OTR, the model follows in the footsteps of the Sport versions of the Lexus RX luxury SUV and IS saloon in combining sportier styling and competitive pricing. Exterior design features bring black detailing including the signature spindle grille and frame and door mirror housings as well as new 18-inch alloy wheel with a two-tone dark/bronze finish. The cabin brings the option of an all-black interior finish with leather-like upholstery (as featured in the NX SE), or black with contrasting white accents on the seats and a bespoke instrument panel. Silver trim inlays are featured as standard. First deliveries for the new NX Sport start at the beginning of July.